A trio of highly stressful events in the late 1990s set Linda Odom, then on the management fast track at Delta Airlines, on a wholly unexpected path into the expressive arts. After 29 years, she’s still at Delta, but not on the same career track; she’s back to her roots as a flight attendant. 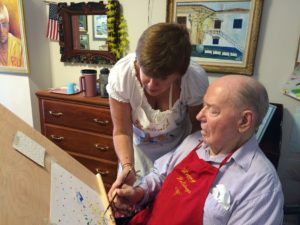 Balancing her time in the air is Linda’s joyful, “pinch-me” role as a healer, most notably as the director of the Creative Connections program at HealthSouth Rehabilitation Hospital in Sarasota. The question was, play at what? Within short order, she had signed up for a creativity class at an art school in Atlanta. On the last night of class, the students had to create their future in any medium. Linda painted waves, a house, a big dog, a book and sunshine. In reality, she lived in landlocked Atlanta – no sea, no dog, but working like one! Taking a step towards her future, in November 1999 she rented a place in Venice and spent her first winter in Florida, which included classes at Ringling and the Women’s Resource Center. That painting hung on her bedroom wall as a reminder to write, dream, plan… and slay some dragons. “I still had my wings,” remembers Linda, who had continued to fly as an attendant while on the management fast track. “I thought – why not? But before that was a special assignment with Delta and being available to help her Dad, who had a stroke and was living near Atlanta. Four months after 9/11 she took on another special assignment helping Delta downsize for survival, using counseling skills she had acquired earlier that year. “After eight months, I was burned to a crisp,” recalls Linda. “I said, ‘just let me fly.’ And eventually, they did.” In 2005, she began flying full time, living at the beach, doing pro-bono community work with older people and enrolled in the Art & Healing certificate program at Ringling College of Art + Design, an experience she describes as “a plant coming to life.” It was during this time that she first was introduced to a group of people interested in starting a coalition to support the arts in health in Sarasota County. After attending that initial meeting, Linda decided to participate as much as possible – which she continues to do today as part of the leadership group for Arts for Health Sarasota-Manatee. As Linda approached completion of the Ringling program in 2008, Victoria Domenichello-Anderson, the program’s co-founder, played a video about the arts and healthcare program at Shands Hospital in Gainesville. “They were dancing, doing art with the patients, recalls Linda. “It really spoke to me and brought tears to my eyes.” That Monday morning, she googled Arts and Medicine at the University of Florida and enrolled in an accelerated certificate program in the summer. “I remember saying to myself, ‘I don’t know why I’m here, but I’m going to work in a hospital and start a program,’” she says. At Shands, she learned the nuts and bolts of how to create such a program. Shortly afterward, she did her Ringling practicum at Moffitt Cancer Center in Tampa and continued to work there as a volunteer for another year, building her flying schedule around it. As the universe would have it, her Dad’s last six months of life became yet another teaching moment in the expressive arts. “I brought my oil pastels, sketchbook, and journal, and put up art in Daddy’s room,” says Linda. “He couldn’t see so well, but the nurses loved it. We played music and I kept thinking, there has got to be more. “Then right before he passed in 2010, I got a call that a Ringling grant to work with HealthSouth Rehabilitation Hospital, a 100-bed inpatient facility, had come through and would I be part of the team? This was a real incubator with about 10 of us working on the grant, including several other Ringling certificate graduates.” They taught touch drawing, working weekly with stroke patients and with caregivers and staff as well. As soon as she was back on the hospital floor, Linda remembered that ‘fire in the belly’ from Shands and Moffitt. “They wanted to live, and I needed them as much as they needed me,” she says. The group produced a video as part of the grant and the hospital said they’d be back in touch. Linda went back to flying and volunteering at nursing homes. About six months later, HealthSouth asked for a proposal to continue the program and in February 2011, Creative Connections was launched. It now encompasses two expressive arts classes on Saturdays and Art at the Bedside or Open Studio on Sundays. The specialty classes include Picture This and Painting from the Inside Out. Linda initially used Art & Healing students as interns. Sarasota expressive arts facilitator Cynthia Bydlinski now serves as Linda’s “right-hand woman.” Linda says the program would not be where it is today without the help of others. The hospital recognizes the value of what they do. For Linda Odom, flying for Delta during the week and being an expressive artist on the weekends represents a tricky balance. But bottom line, this dual routine brings together the two sides of her personality – each with its rewards. “The HealthSouth program taps into the creative, the spiritual, soulful side of me,” says Linda. “I also do some marketing and speaking for the hospital, which appeals to the business side of me. That same side also still enjoys the travel and the passengers. I’m learning the hard way that self-care important, so I’m starting to say ‘no’ when I need to. Frank was a stroke victim whose hand was impaired. 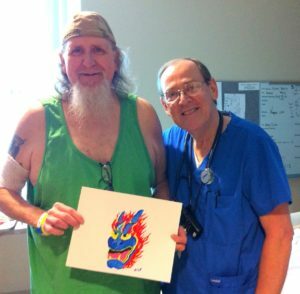 When he came to HealthSouth, he didn’t think he could do anything. 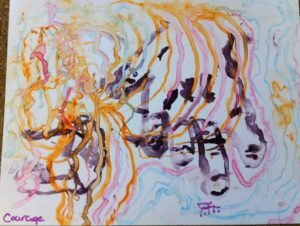 Linda offered him watercolor crayons on “Yupo” paper, which has a slick surface that allows the paints to run and create abstract patterns. When he dropped the crayon, she simply changed the color so he wouldn’t see it as a defeat. He outlined his hand and called his painting “Courage.” Why? “Because it took every bit of courage I had to do what you asked me to do,” said Frank. Marty’s story Marty used to be a graphic artist before neuropathy hit him. Encouraged by a supportive staff nurse named Roger, Linda asked Marty if he’d like to paint himself if she gave him a pattern to follow. When he asked about the colors of the dragon tattoo on his back, Linda took a picture of the tattoo on her iPhone, put the phone down next to him along with paper and acrylics, and left for over an hour. When she came back, he had done an incredible picture. “I’m pretty stoked right now,” said Marty, shown here with Roger.